There are crores of products on the Amazon marketplace and some of them could either be similar to yours or provide the same benefits as yours. As a seller, you would want to ensure that customers are choosing your product and buying from you. This is where Lightning Deals will help you. When you list your products for Lightning Deals on Amazon.in, it gives your customers an exciting incentive to buy from you by reducing the cost of their desired product for a limited time-period. It gives you the opportunity to get a new customer and build trust. So, how does lightning deal work? A Lightning Deal is a time-bound, promotional offer in which an item is featured on Amazon.in’s Today’s Deals page for a few hours. To be eligible, you have to be a registered Amazon seller and should be using FBA (Fulfillment by Amazon) as your logistics partner. More visibility: The deals page on the Amazon.in marketplace is one of the most visited pages by shoppers. If you opt to use Lightning Deals, your deal will be listed here giving your products added visibility. Halo effect: The increased product visibility lasts through the offer and even after the offer ends. Clear out inventory: Lightning Deals also help you sell overstock or seasonal products. If you have a range of products that are not fast moving and you would like to clear up the stock quickly, you can list them under Lightning Deals. How to avail a Lightning Deal? Alternatively, you can also get in touch with our Seller Support team and seek their assistance or watch this video. To suggest your own deal you have to keep an eye out for an invite from account-management-india@amazon.in in your email account. This email invite is sent out every two weeks. You should fill in the complete form* with your details (shared via the invite email) and remember to respond within the deadline. You can also watch this video to learn more about how to suggest your own Lightning Deal. * Please note if you want to promote more than one product, you would need to fill a form for each product. >Customers love deals with high product availability. Include as many variations (like size, colour, style, and so on) as possible. >Customers love low prices. Offer the most attractive price possible. Once your deal is selected, you will receive an email with confirmation. Each deal is live for a limited number of hours on any one day during the Amazon Lightning Deals week. How to get started on Amazon as a seller? 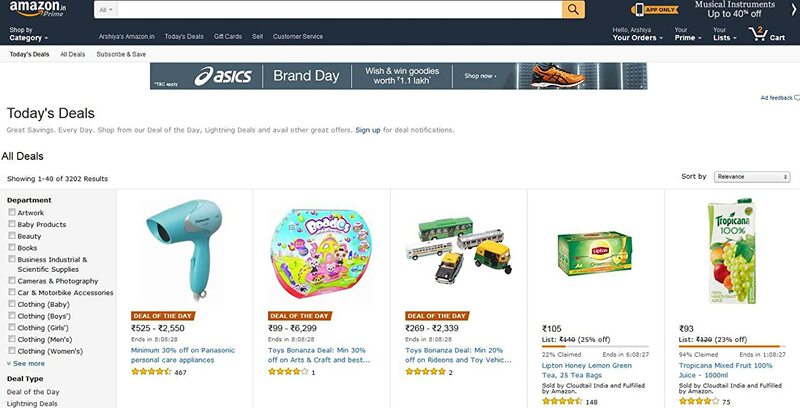 To get started with selling on Amazon, you can click here and to join FBA and gain eligibility for Lightning deals, you can click here.